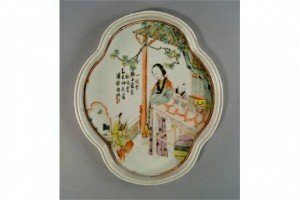 A Chinese porcelain quatrilobe shallow bowl, late 18th century, with ridged rim, painted in famille verte enamels with a woman and two children in a garden landscape scene, inscribed with poem and artist’s seal mark. 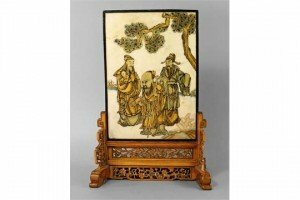 A Chinese composition table screen, 20th century, painted in gilt to one side with Shou Lou and two attendants under a pine tree and with two women in a fenced garden landscape to the reverse, on a pierced carved wooden base. A diamond and pearl necklace. The split pearl and rose-cut diamond cluster drop, suspended from a split pearl and old-cut diamond surmount, to the vari-cut diamond line sides with pearl accents and black bead terminals. 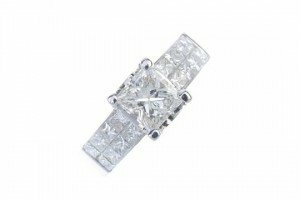 Principal diamonds estimated total weight 0.60ct. 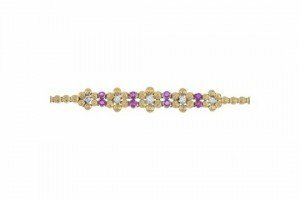 A ruby and diamond bracelet. 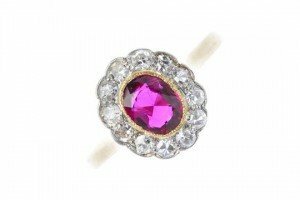 Designed as a series of graduated flowers, each with brilliant-cut diamond centre and textured petals, to the circular-shape ruby double spacers. Estimated total diamond weight 0.35ct. A pair of sapphire and diamond cluster ear studs. 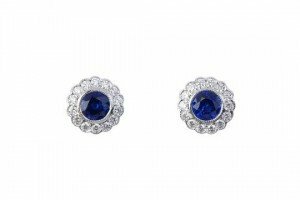 Each designed as a circular-shape sapphire, within a millegrain border and brilliant-cut diamond surround. Estimated total diamond weight 0.30ct. 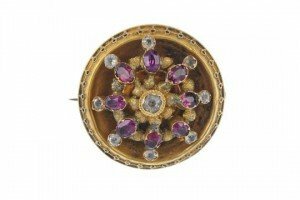 A Victorian gold gem-set brooch. The circular-shape greyish-blue gem collet, within an oval-shape garnet and circular-shape greyish-blue gem double surround, to the raised motif border and lock of hair reverse. A ruby and diamond cluster ring. The oval-shape ruby, to the single-cut diamond scalloped surround, to the tapered shoulders and plain band. Estimated total diamond weight 0.45ct. A 14ct gold diamond dress ring. The square-shape diamond, to the square-shape diamond two-row sides and plain band. 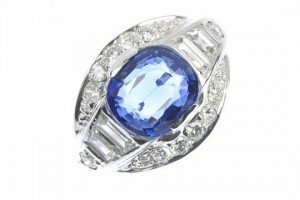 A sapphire and diamond dress ring. The oval-shape sapphire, with tapered baguette-cut diamond sides, to the brilliant-cut diamond surround and plain band. 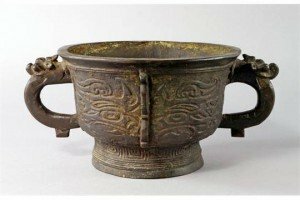 A Chinese bronze Zhou style ritual food vessel, gui, 19th century, with mask set handles, the body case with tao-tie mask above a Greek key border. 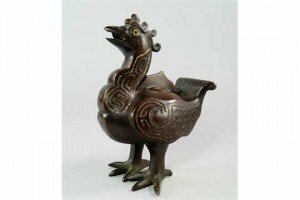 A Chinese bronze incense burner, late 19th/20th century, in the form of a phoenix, with archaic style moulding to the body and white enamel inlay to the recesses. 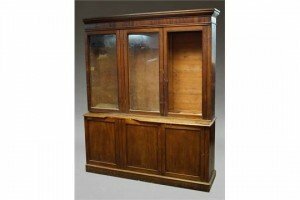 A Victorian mahogany bookcase, with a cushion form cornice above three glazed doors, the base with three panelled doors, on a plinth base, probably cut down from a larger piece. 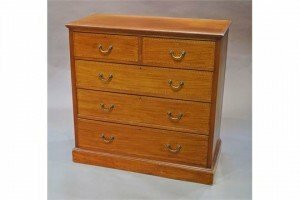 An mahogany chest of drawers, early 19th Century, with kingwood and ebonized inlay of herringbone pattern, with two short drawers over three long drawers. 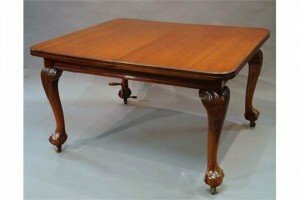 A mahogany wind out dining table in the Victorian taste, the rounded rectangular top above carved acanthus capped cabriole legs to ball and claw feet, with two extra leaves and winding key. 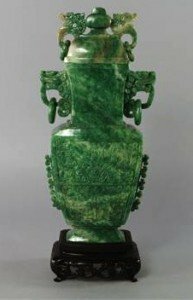 A 20th century Chinese green hard stone archaistic vase and cover. The cover with dragon and loose ring handles, the base with lion mask and loose ring handles, carved with tao tie and with stylised lugs, seated on a pierced carved hardwood base. 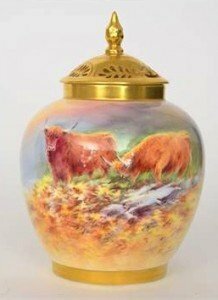 A later 20th Century pot pourri and spire cover decorated in the round by former Royal Worcester artist Raymond Poole with hand painted Highland cattle. 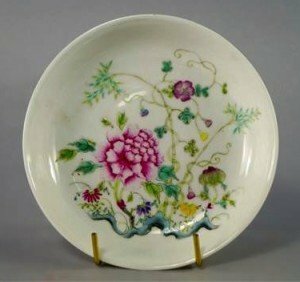 A Chinese porcelain shallow bowl painted in famille rose enamels with chrysanthemum, bamboo and lotus blooms with an iron red six character Guangxu mark to base. 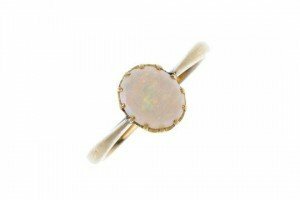 A mid 20th century 9ct gold opal single-stone ring. The oval opal cabochon, to the tapered shoulders and plain band. 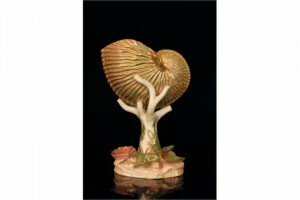 A Royal Worcester spill vase modelled as a nautilus shell raised to a faux coral pedestal with moulded shells to the base, the whole decorated in green and pink enamels with gilt detailing. 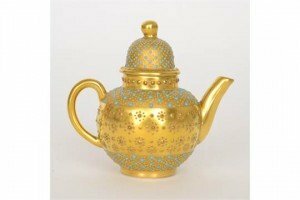 A small contemporary teapot decorated by former Royal Worcester gilder Ken Russell, the gilt ground with blue enamel jeweling, after the Dudley service.